Walk the most famous Balcony in the Alps, from Lenk to Grindelwald on this self-guided walking holiday. Admire the mighty peaks; follow paths offering a great variety of mountain landscapes and traditional villages filled with colourful flower-filled window boxes and stunning high altitude lakes. Your accommodation for the first night of this trip is in Swiss village of Lenk. Set in stunning mountain scenery the Alpine town of Lenk has its own thermal pools. If you arrive early today you may wish to hike to the foot of the Wildstrubel massif which takes between 3 and 6 hours and is between 7.4km to 23.5km, depending on the route you choose. Leaving Lenk today you take a beautiful ascent up to the pass of Hahenmoos (1956m). From here you hike downhill into the pastures all the way down to the village of Aldelboden where you spend the night. This charming chalet village is home to a 15th century church and largest fondue parlour in the region! Today's 14km walk is expected to take approximately 5 hours and you will ascend 1000m and descend 1250m. Today you have a challenge ahead of you with a demanding but rewarding hike. The walk starts off passing through the cow-filled meadows of Allmenalp, with the path slowly getting steeper as you rise up towards the top of the pass. Here you will be able to soak in the beautiful scenery and amazing views over the Alps. Cross the Bunderspitz pass at 2,546m and enjoy the scenic but steep descent into the Ueschinen Valley to Kandersteg where you spend the night. Today's walk is between 16 km walk is expected to take approximately 7 hours and you will ascend 1250m and descend between 700m to 1350m. Travel to the highest point of the trip with the pass of the Hohtürli (2778m), at the foot of the Blümlisalp massif (3663m). Start by taking the chair lift to a lake which is fed by a series of mountain creeks and its power harnessed to help provide electricity and water to a local village. From here you walk to Griesalp, where you will spend the night at a welcoming mountain inn. Today's 14km walk is expected to take approximately 6.5 hours and you will ascend 1200m to 1600m and descend 1400m. Walk through the middle of rich pastures with decorated chalets with a backdrop of glaciers and high mountains, dominated by the Grosshorn (3754m) and Breithorn (3785m). The route takes you along a pass and then descending to Murren where you take the train down to Lauterbrunnen where you spend the night. Today's 14km walk is expected to take approximately 6.5 hours and you will ascend 1210m and descend 975m. Start with a climb up to the waterfalls of Trümmelbach, a series of ten glacial-waterfalls carved inside the mountain. Next this spectacular stage due to the numerous waterfalls and views nearby peaks goes along the north face of the Jungfrau, Mönch and Eiger mountains using a pass at 2061 metres. Descend to Grindelwald where you spend the night. Today's 20km walk is expected to take approximately 7 hours and you will ascend 1250m and descend 1050m. Day 7 - Circular walk from Grindelwald. Trip ends Grindelwald. If you have extra time we suggest that you go and discover the Faulhorn (2680m), a first class summit you can approach in four different ways and which offers an exceptional view of the high peaks around and further to the valley and its lakes. You can walk directly from the hotel, take a cable car to 2168m or take the local bus and a trail at the foot of the Weitterhorn Mountain. Alternatively you could take the rack railway. This is a 21km walk is expected to take approximately 7 hours. This can be shortened depending on which route you take. Light clothes suitable for walking in warm weather are recommended (July and August can be extremely hot). However early and late in the season (May/Juneeptember/ October) also bring warm clothing in case of drops in temperature or the odd shower. A fleece jacket is a good thing to have at any time of year when in the mountains . Well worn, sturdy walking boots with good ankle support are essential for the walks. We recommend bringing sandlas and trainers for relaxing in the evenings. Bring one main piece of baggage as per your airline luggage allowance, maximum 20 kg per person. Remember you may need to carry your luggage at times so don't overload yourself. When travelling on public transport you should always keep your luggage with you. Bring a personal water bottle (at least 2l capacity) and sun protection for use during the walks. You may find a trekking pole useful over the downhill sections. You may also wish to take a swimming costume and towel. Cable cars and chair lifts can be used to alter the distances of the walks. These will need to be paid on the spot locally. Day 3 Adelboden to Oye = 4 CHF or you can take the bus. For this trip you can fly into and back from Bern, Geneva, Basel or Zurich airports. We recommend flights into and back from Bern, Geneva, Basel or Zurich airports which are served by the budget airlines Ryanair and Easyjet, from multiple airports in the UK. You can also use and non-budget airline (including British Airways) from multiple airports in the UK. At the start of your trip you can fly into Bern, Geneva, Basel or Zurich airports. You can take a train from these airports to Lenk. The shortest journey is from Bern to Lenk the train takes 2 hours, Geneva is the slowest taking 3 hours 40 minutes. 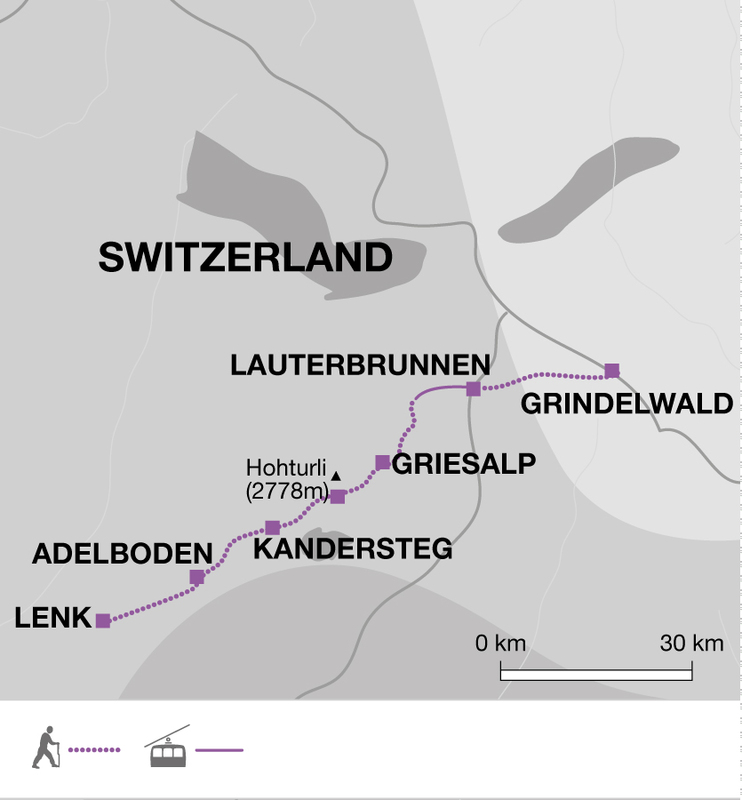 You can return from Grindelwald to lenk using the Interlaken train which leaves every 30 minutes after 2pm. 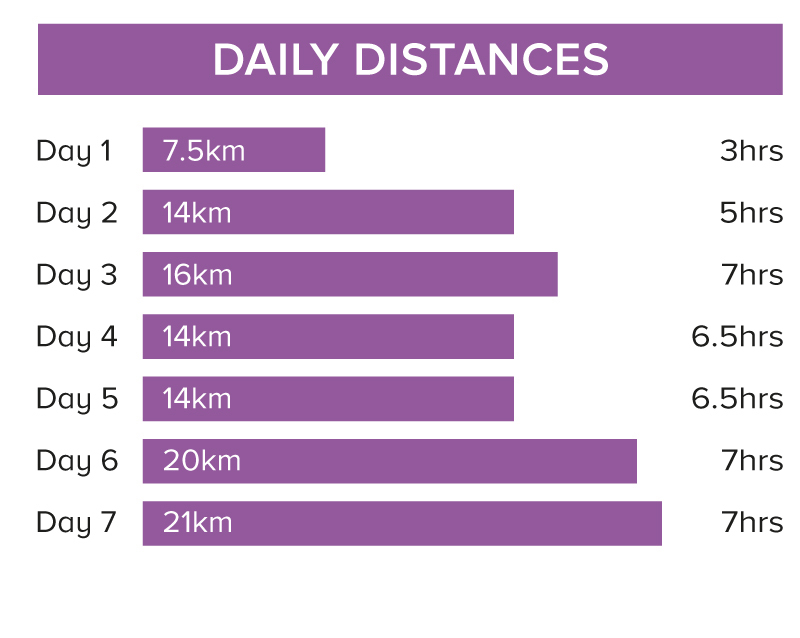 On this journey you walk 99km over 6 days (an average of 16.5km a day). You follow well-marked hiking trails. The route involves some steep ascents and descents of up to 1250m in a day and some of the days are very long. There are no technically difficult sections nor scrambling required, but the trip is not suitable if you suffer from vertigo as there are sections where you could feel exposed. We have graded this route as challenging. Mon 1 Jul 2019 - Sun 15 Sep 2019 Your trip can depart anytime between the above dates. Contact us for triple room requests and solo traveller prices.